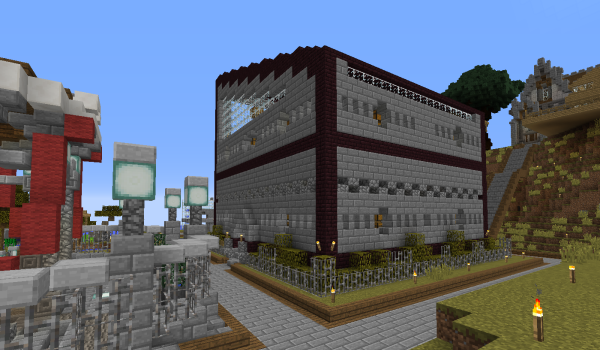 Ever since gates were introduced for the Nether rail network, the former Nether hub, Nether Central Station, is receiving a lot less traffic. This made the post office far less convenient to reach, since you'd need to backtrack through the Nether only to check your mail. To improve on this, we've decided to move the post office to the natural trading location of many players: Point Zero, in Rodinia, right next to the spawn point. For those not familiar with the post office, it's a building full of mailboxes taking the shape of chests. Each player is allowed to claim a single chest by placing a sign with their name on it, and using the /cdonation command on the chest itself. That way, you get a mailbox that anyone can drop items in, but that only you can take anything out. Perfect for sharing items with other players, and they don't even need to be online at the time! To make players easier to find in the new structure, players have been split in four groups based on the first character of their username: names starting with a number, an underscore or the letters A to D go at the bottom left, E to K to the bottom right, L to Q at the top left, and R to Z at the top right. Anyone who currently has a mailbox, please clear the one in Laurasia's Nether and claim one in the new Rodinia location. The old post office will eventually be closed off. Thanks to Sora for the new building! Nuke the old one from orbit, it's the only way to be sure! Old one de-signed, new one created.